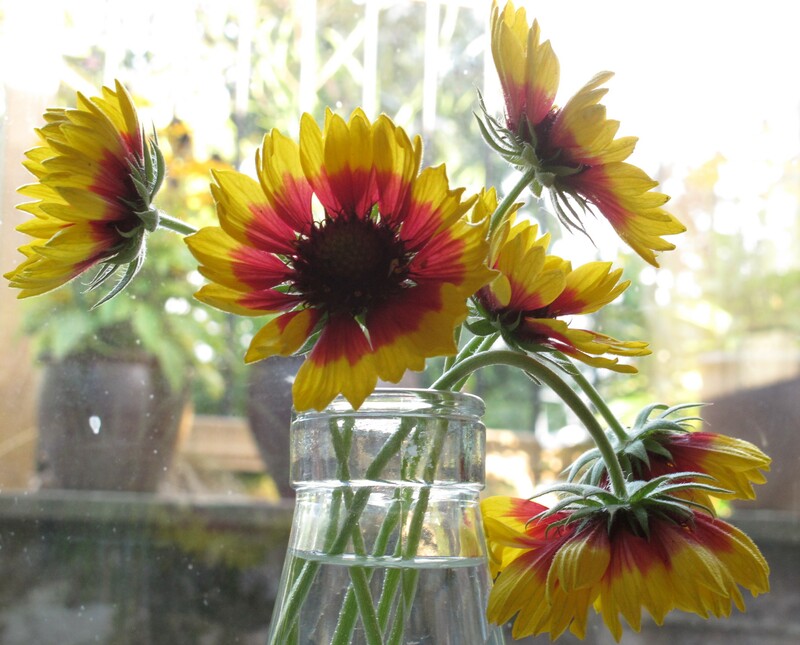 My favourite cutting flower this month has been the gaillardia. Not because of their sunny little faces – pretty as they are. It is their scent. For me, it is the true smell of a proper cut flower. It takes me back 30-odd years to when I helped dad delivering veg to the wholesale market. We’d drive there in the mini pickup and find a spot to unload boxes of lettuce, crates of cabbage or whatever we had to sell that day. 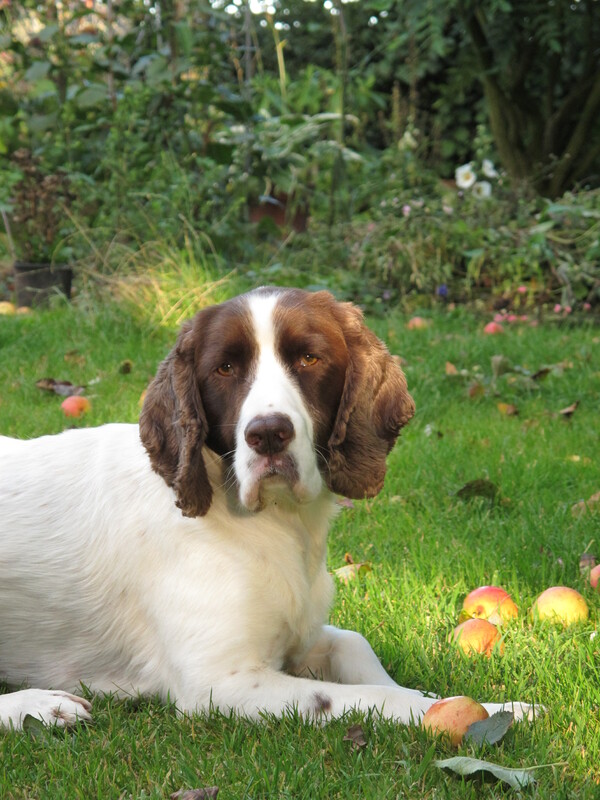 If we were lucky, The Broom Man (so christened by my sister and I because he was always sweeping the floor) would pilfer a couple of plums or a handful of cherries for us. One side-hall was always packed wall-to-wall with buckets and buckets of chrysanthemums. Their fresh smell filled the whole place, mingling with the earthier odours of spuds and cabbages. When Steve grew the gaillardia I had no idea they would be so nostalgia-inducing. 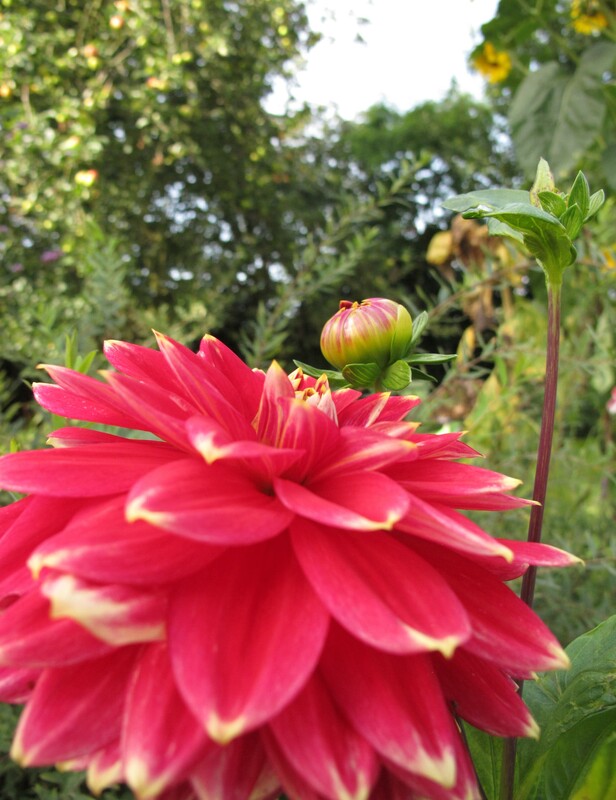 They have become another firm friend of the garden, and we will be growing more next year. 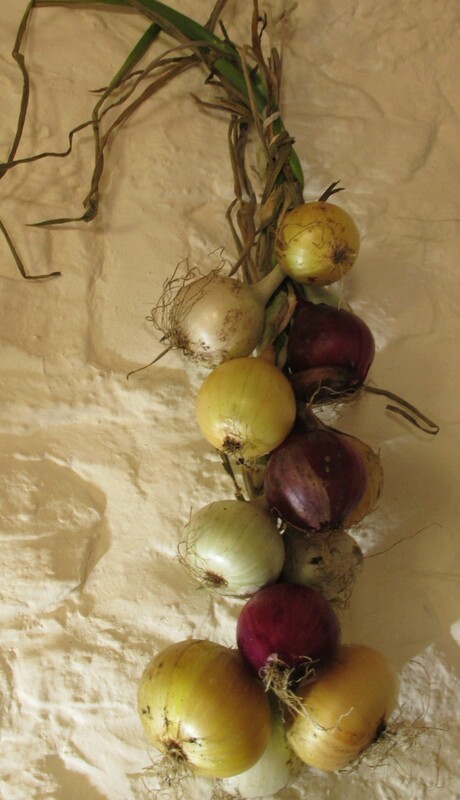 OK, so they aren’t flowers, but since they are adorning the kitchen walls at the moment, I thought the onions deserved a mention. I think I am happier with my onions than with any other veg we grew this year. I really neglected them, planted them too late, rarely watered them, let them get smothered by the rampant squash plants, but still they grew. 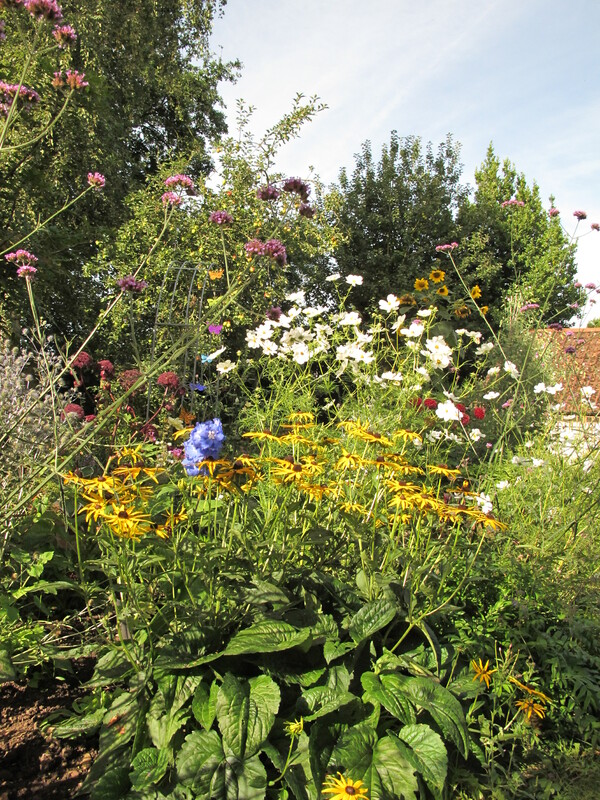 This was a tri-colour set mix from Pennard Plants (everything I have grown from there this year has done brilliantly). They looked so pretty that I couldn’t bear to put them away in a cupboard. I found some tips on plaiting onions on the Organic Gardening website, and decided to have a go. Considering my habitual clumsiness I was actually quite pleased with the result. They could be tidier, but they’ve been hanging for a few weeks now and haven’t unraveled. The trouble is, I like looking at them so much that I don’t want to eat them. 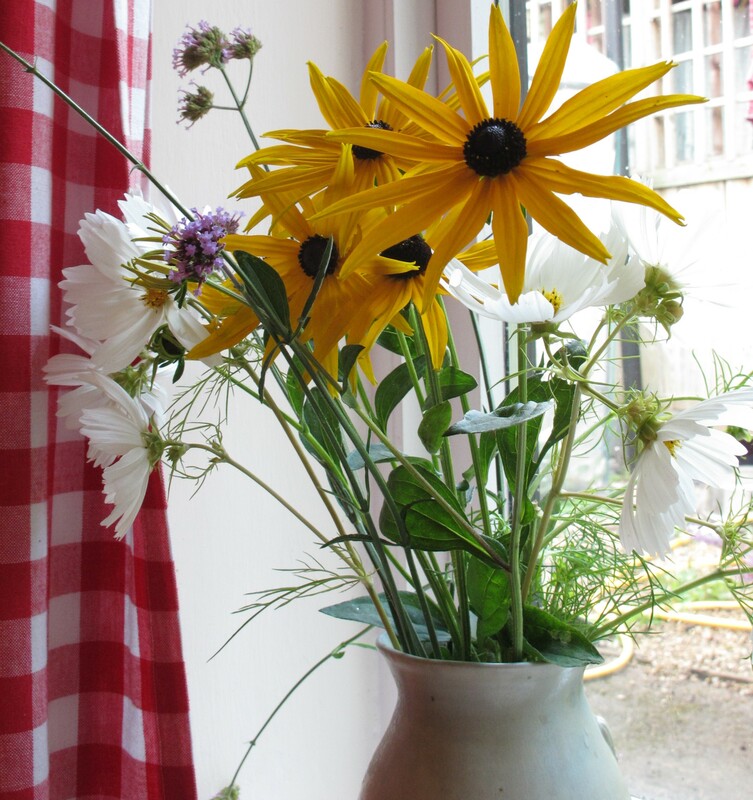 Cosmos, rudbeckia and verbena bonariensis are still prolific and providing us with plenty of plonk-and-go country bunches. I think we may get another month out of them. Other than that, I’m not quite sure what we’ll be bringing into the house over the next few months before the spring bulbs make a start. Hopefully something I’ve forgotten about will come into flower soon. Rosemary, the lady who lived here before us, took me around the garden a few weeks before we moved in. I hoped to find out if there were any particularly special plants or trees. And I did, but not quite in the way I expected. One of our first stops was the apple tree. She told me how her late husband had grown it from the seed of a Marks & Spencer apple 50 years ago. It was November, but there were still hundreds of apples on the ground. Rosemary loaded my arms with them and warned me that we should eat them soon; they tasted great, but weren’t keepers. 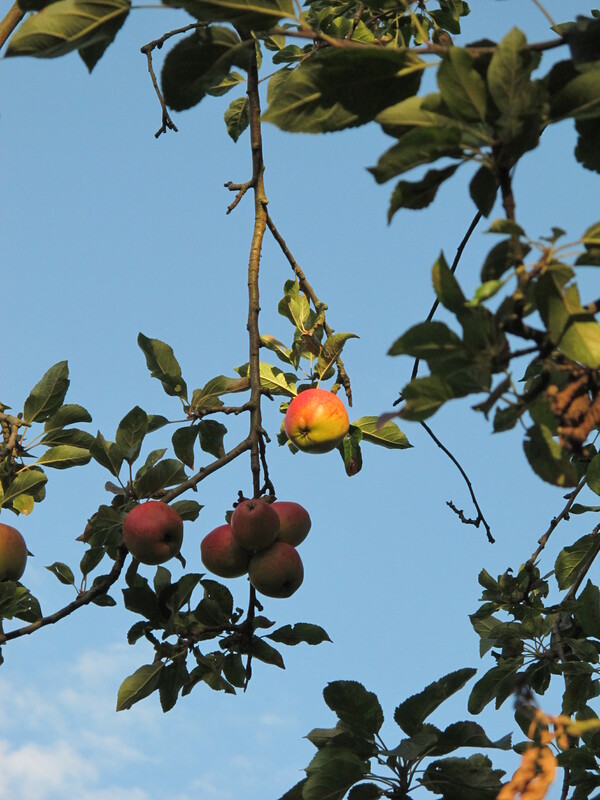 Last year – our first year here – it only produced a handful of fruit. I secretly wondered if the tree didn’t like us. Then Steve told me it had been a bad year for apples everywhere. Something about it having been too wet for the pollinators when the blossom was out. I don’t think he actually knew this, he must have heard it on Countryfile or read it in one of his gardening magazines. But it seemed more rational than my theory. Anyway. This year, the branches are literally groaning with fruit. Most of them are way out of easy picking reach, but when it’s windy they come hammering down. They are quite wormy, but the dogs are having a field day playing with them and munching them up all round the house and garden. This evening I resolved to pick a few before they fell. I thought the ones still on the tree might be a bit less wormy, and certainly less bruised, than the ones on the ground. Have you seen those telescopic pickers you can buy? They have a sort of basket at the end of a long pole. I’ve always thought they look a bit ridiculous. But they don’t look anything like as ridiculous as the one I fashioned out of M’s pink fishing net, a hazel branch and some tape. 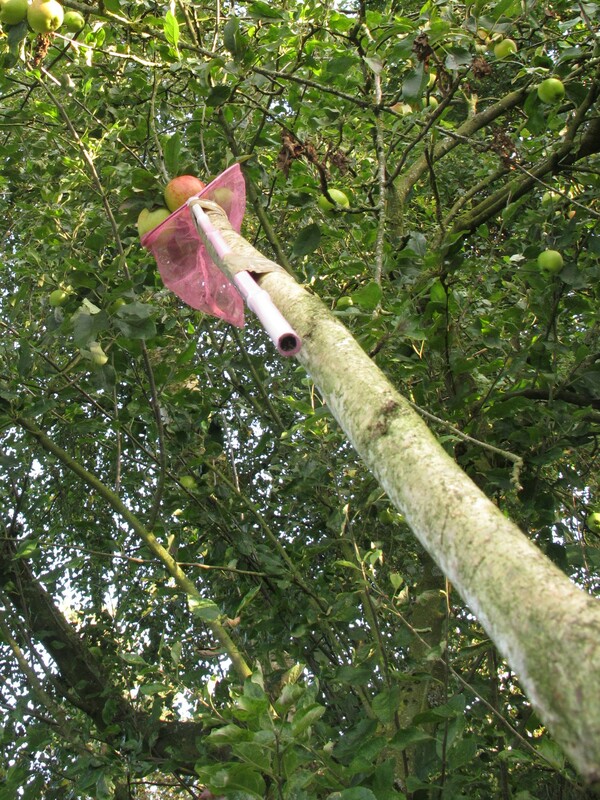 Or as ridiculous as I looked waving it around trying to hook and pluck apples 15ft up in the air. I did manage to land a few of the M&S apples. 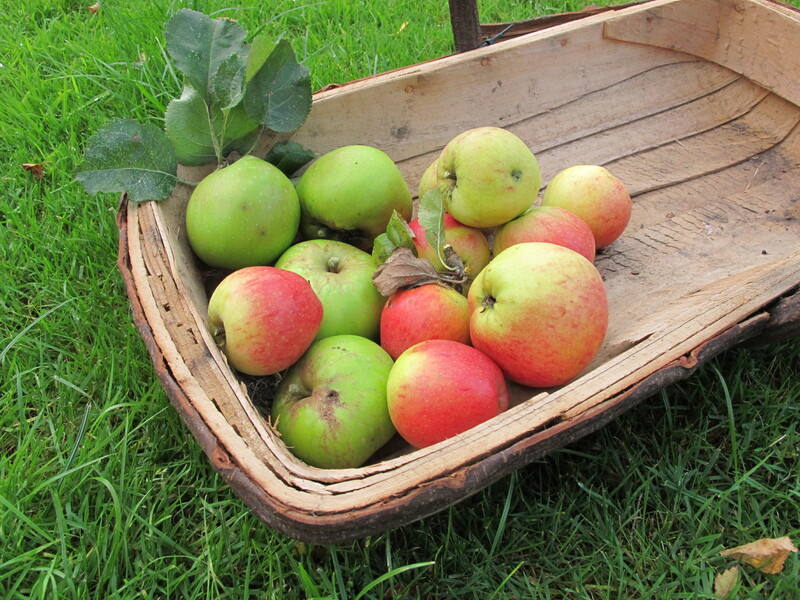 And some Bramleys from the tree behind the garage. Some them came down to earth gently in the net. Some of them just fell as I thrashed around and are no doubt bruised. Most of them are wormy. 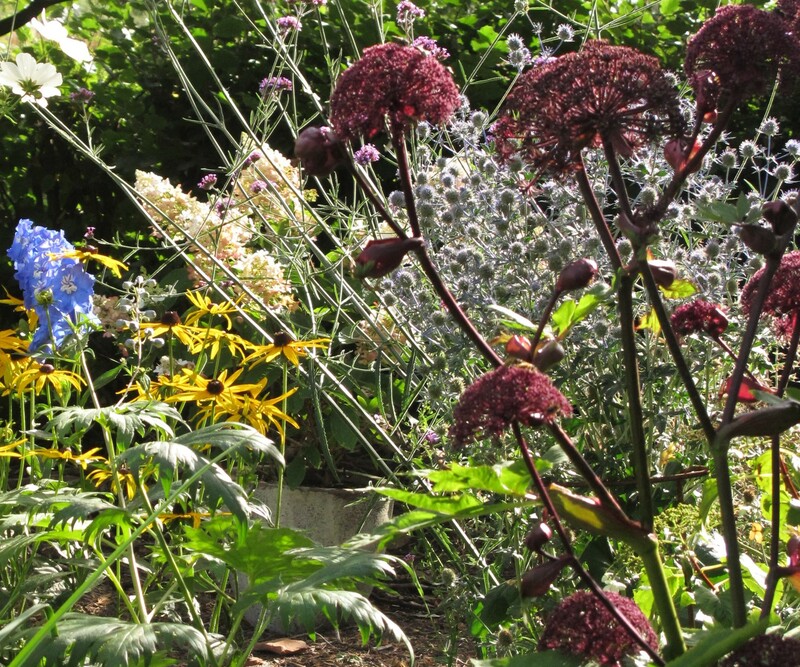 When we started gardening, supporting wildlife was one of our main aims. 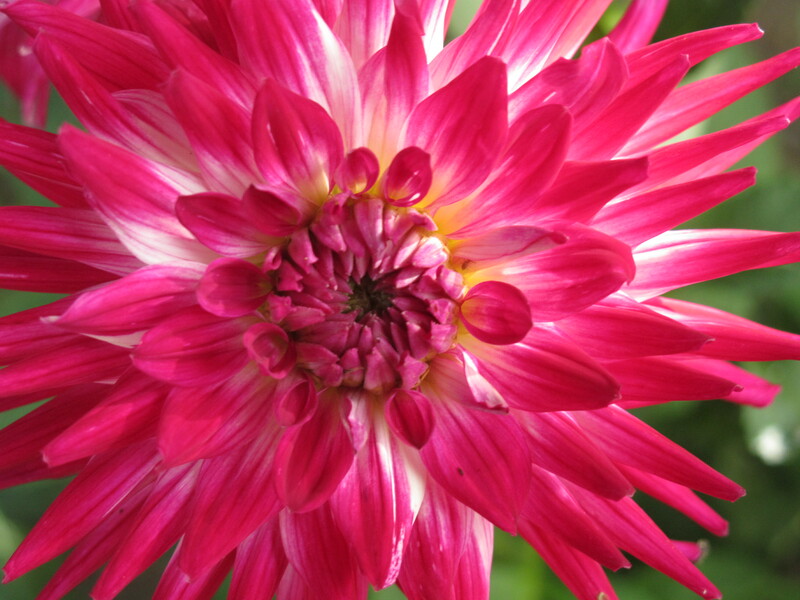 We chose plants loved by birds, bees and butterflies. We left plenty of undisturbed wood, leaves and other potential habitats around the edges of the garden. We hoped for hedgehogs and slow worms, and have been rewarded with both. I can’t say flies and wasps were high on our agenda. But that is exactly what one plant has been teeming with for the past couple of weeks. 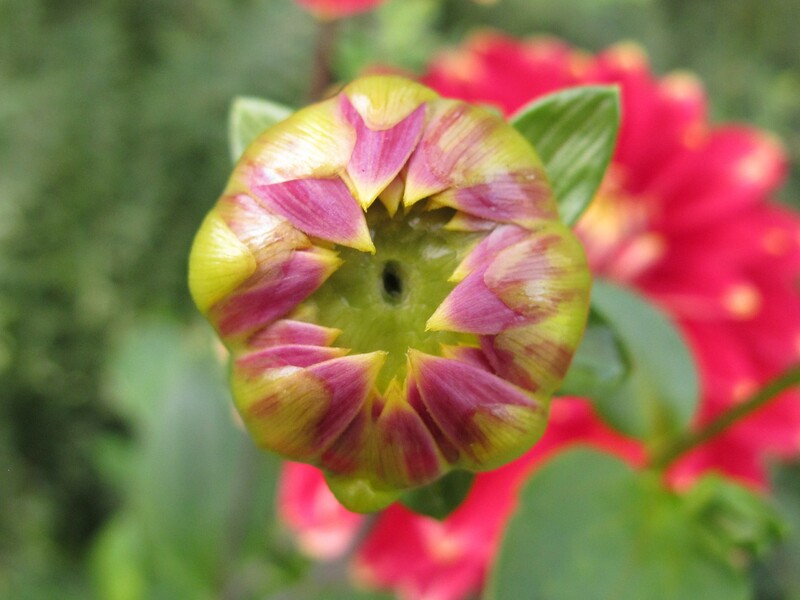 Angelica Gigas arrived in the post for Steve one day in early spring. 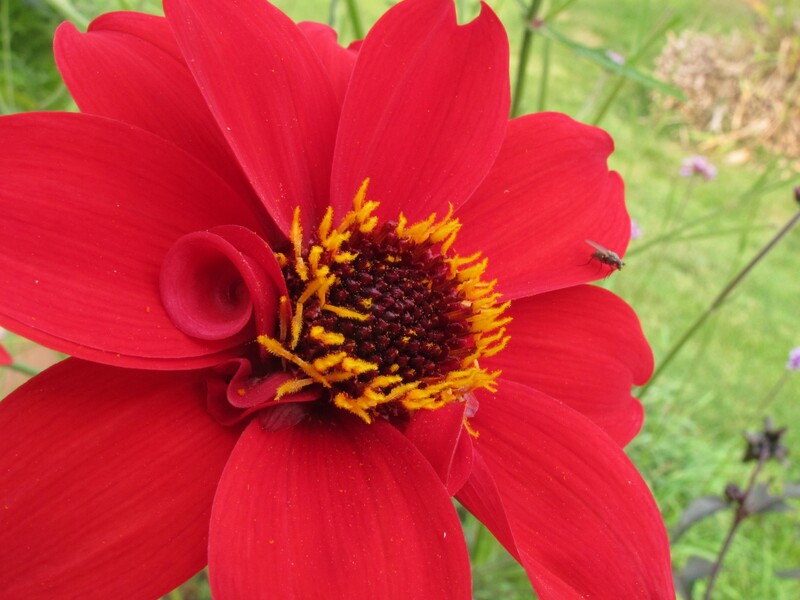 I had no idea what it was, but he insisted that it take a precious spot in the main border. He said I would be impressed. Well. 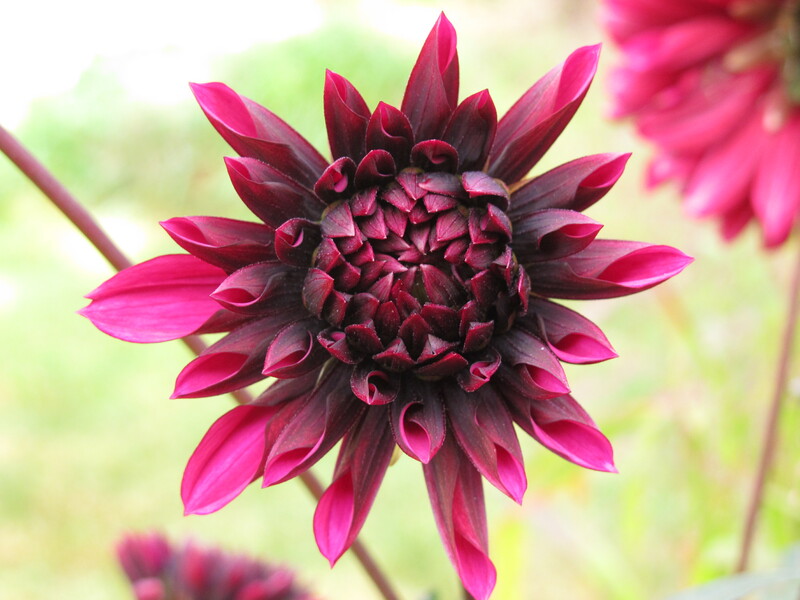 I watched with interest as its weird purple stems slowly extended during the summer. A few weeks ago alien-pod-like buds began swelling, then burst with clusters of darkest purple flowers that remind me of broccoli florets. The flowers must be quite sweet. At any given moment, each of them is crawling with countless insects of all shapes and sizes. There is something hideous yet strangely hypnotic about watching so many creatures gorging on such a grotesque plant. When you take a step or two back, it is just as arresting. Its statuesque form adds welcome structure to the border – especially since the recent rain has beaten down the lupins that were alongside it. And its dark colouring makes an impact among the blues, yellows and whites that dominate at the moment. 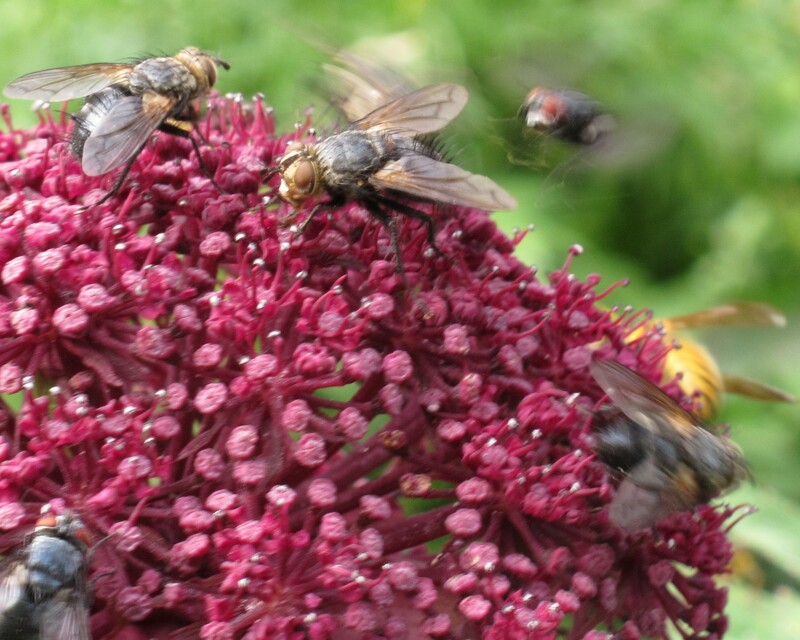 As for the flies and wasps, I guess they are just as important as any other pollinator in the grand scheme of things. And according to charity Bug Life wasps eat greenfly. How could anyone fail to be impressed by that? 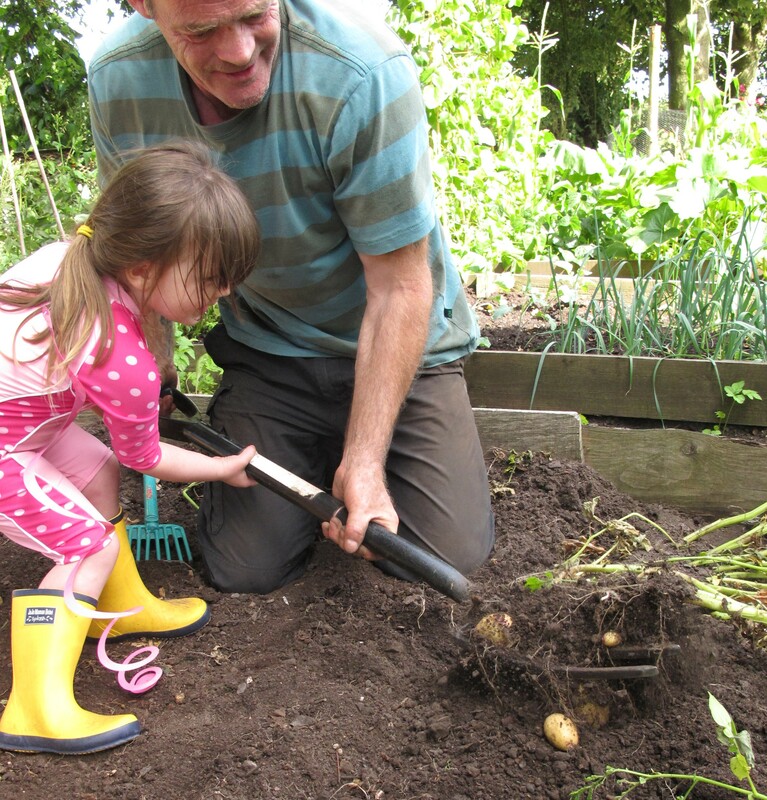 One of my most vivid childhood memories is harvesting potatoes with my parents. Dad would drive his old red Massey Ferguson up and down rows which seemed to stretch on forever. He had a strange clawed contraption on the back of the tractor that would lift and turn the plants leaving furrows of soft soil. Then my mum, my middle sister and I would scrabble around for the spuds. I can’t recall if we just lifted and sorted them, or if we bagged them up. But I do remember the smooth round firmness of the potatoes and how perfectly they seemed to fit my hands. The sun was always warm on the backs of our necks and the soil was cool. I must have been eight or younger as my little sister was never there. But even as a young child the experience felt somehow calming and restorative. 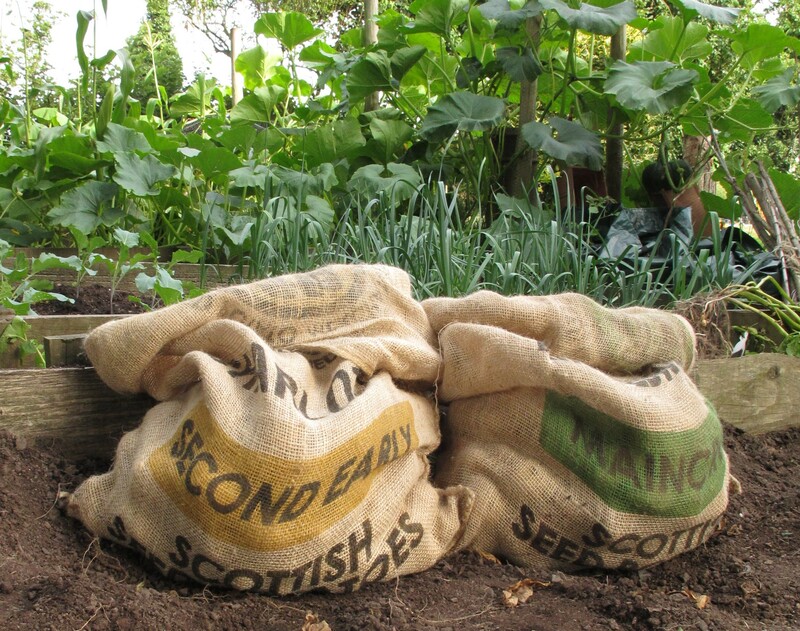 Perhaps there is something about being outdoors with your hands in the soil that appeals to people at a primal level. That was almost 30 years ago. Soon after, my parents were forced to give up market gardening and focus on growing ornamental plants as the UK began importing cheap mass-produced veg from overseas. Funny how things have gone full circle now. 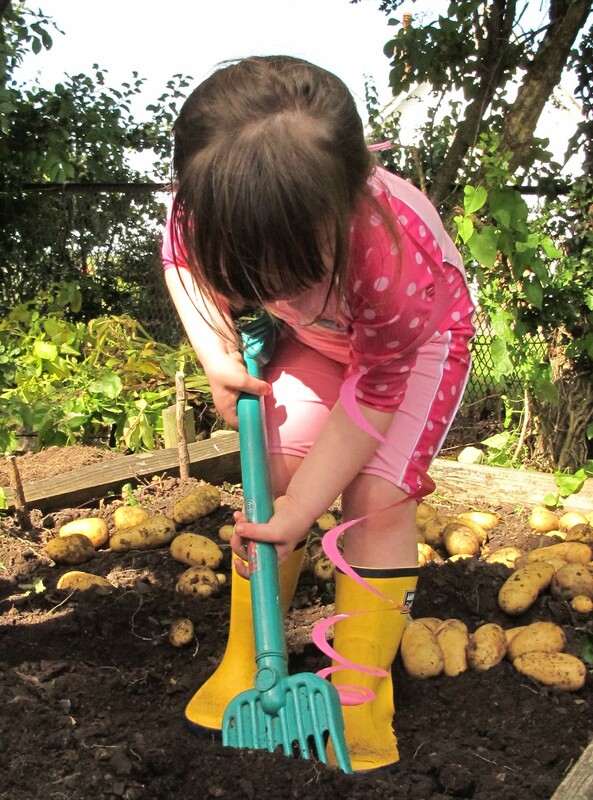 Last weekend, we harvested the remaining bed of potatoes in our garden. Watching M enthusiastically joining in made me feel glad that we may be creating similar memories for her, albeit on a smaller scale.